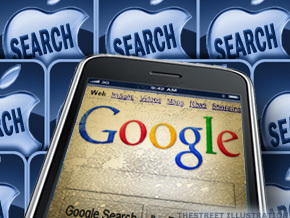 The nascent mobile advertising market sees Apple Apps pitted against Google search. NEW YORK ( TheStreet) -- Google ( GOOG - Get Report) has built a bridge from desktop empire to the mobile search frontier, but phone application developers are trying to detour the traffic. Apple ( AAPL - Get Report), the biggest mobile application operator, has issued a challenge to Google for control of the nascent mobile advertising industry. Last month during an Apple iPhone OS 4.0 speech, Apple chief Steve Jobs declared it was open season on search. "People aren't searching on a mobile device like they do on desktops. What's happening is that they are spending all their time in apps," Jobs said during his speech on April 8. "They are using apps to get to data on the Internet rather than a generalized search." While that may not even be true for Jobs or his company, the point was clear -- mobile search is a new arena and Apple intends to capitalize. "Apps are very hyper-specialized search engines. It gives you hundreds of little tools versus one big tool," said Danny Sullivan of SearchEngineLand, a search industry journal. Pick an interest, and there's probably an app for it. Gardening, nightlife, dining, birding, cooking; fans can download an app and get access to very specific information that can be further filtered to show what is near your location or within your favorite parameters. In his speech to introduce iAds (ads that will run inside applications), Jobs sharpened his point against Google, adding that using apps like Yelp to find restaurants nearby "is where the opportunity is to deliver advertising." And there it is, the holy grail of the Net search business: ad sales. As noted in the chart above, Google controls the traditional search engine market by a wide berth. (comScore doesn't yet track mobile search data.) More than 97% of Google's revenue comes from search ads, and with computing and search going increasingly mobile, Google has been eager to make itself indispensible in the mobile market, also. Contrary to Job's assertion, for the vast majority of smartphone owners, Google search is by far the leading search service. Mobile ads will bring in an estimated $500 million in revenue for Google this year, according to Caris and Co. analyst Sandeep Aggarwal. That is "perhaps the fastest growing revenue line" for Google, Aggarwal wrote in a research note Monday. Aggarwal also adds that there are a couple challenges along the mobile road for Google. For one, Google's dominance of search means that each mobile search is -- cannibalistically-speaking -- one less desktop search. Second, apps on phones bypass Google search. But Google has hasn't exactly been a coasting on its desktop success. The push into smartphone operating systems with its Android three years ago has been the Trojan horse of Google mobile search. By contrast, Microsoft's ( MSFT - Get Report) disappearance from mobile hasn't been particularly helpful to the mobile adoption of its Bing. And Yahoo! ( YHOO has fumbled badly in mobile search. Google has tried to move beyond the classic browser-based searches in mobile. For example, many Google Android phones, particularly the Verizon ( VZ - Get Report) Incredible and Droid line, have included free Navigation software that combines GPS, Google search and maps for turn-by-turn directions. Google has also honed its verbal searches, so users can speak their search terms rather than type them for surprisingly accurate results. Google's pending $750 million deal for in-application advertising shop AdMob stands to give the search giant a big piece of the mobile advertising market more targeted to display than search. Maybe too big though -- the Federal Trade Commission is reviewing the deal. "Applications are an opportunity for Google," said Sullivan, who points out that Google doesn't have specialized search engines for information on things like restaurants. Outfits like Urbanspoon and Yelp have loads of restaurant data, like menus and reviews, all in one place. "Applications are a threat, but not a big threat," said Sullivan. "People are always looking for the Google killer. I call applications the Google killerettes. They take a slice at Google in various ways."